Click picture to play video – opens in new window. The structurally related rebec and gittern playing a song together that spans much of the life of the rebec. Noël nouvelet is a traditional French new year carol, originating in the early 15th century and becoming one of the most popular of the 16th century. The refrain, “Noël nouvelet, Noël chantons ici” means ‘New Christmas song, Christmas song sing here’! The hymn writer John M. C. Crum made the tune more widely known in 1928 by using the tune for his hymn words, Now The Green Blade Riseth. The origin of the rebec is now widely believed to be in the similarly named Arabian rebab or rabab, thus the evolution of names is presumed to include rubeba, rubeb, rebecca, rebeccum and rebec. However, caution is needed. As anyone familiar with early music nomenclature is aware, similar or even identical names do not necessary signify the same instrument. The link between rebab and rebec seems to originate from Ian Woodfield, The Early History of the Viol (Cambridge: Cambridge University Press, 1984), but Barry Pearce, who runs the online Bowed Strings Iconography Project, points out that this is conjecture, and that there is no primary evidence linking the two instruments. The first brief mention of the rebab in writing is in 9th century Arabia. A more clear description appears in 1377 by Tunisian scholar Ibn Khaldun. In his Muqaddimah (Introduction to History), he described the rebab being played with a bowing string attached to a bent shaft, rubbed with resin and drawn across the two playing strings. In 13th century France, music theorist Jerome of Moravia wrote his Tractatus de Musica, c. 1280, in which he stated that the “rubeba” was “a musical instrument played with a bow”, as if it was new to his readers and had to be explained. He described it having 2 strings a fifth apart, c and g, and it was less important (in France at this time) than the 5 string vielle (medieval fiddle). (Click picture to see larger in new window.) The iconography left and right are from the Cantigas de Santa Maria, an Iberian songbook commissioned by and apparently largely composed by King Alfonso X, written 1257-1283. None of the instruments in the Cantigas are labelled, in common with almost all medieval illustrations. On the right we have an oud played with a 2 string rubeba or rebab, the latter conforming to the 13th century description by Jerome of Moravia (see above). On the left we have two rubebas, also conforming to Jerome’s description. The first extant evidence in writing for the word rebek is in an early 12th century table of Arabic and Latin terms (Paris, Bibliotheque Nationale, Ms. lat. 14754), and this is where it begins to get complicated. There is no illustration with that Arabic/Latin table so, with the notorious fluidity of medieval instrument naming, we cannot be entirely sure what was meant by rebek, and cannot necessarily assume it was the rebec we are seeking, nor is there any suggestion of a connection to the rebab. Writing nearly 2 centuries later, Jerome of Moravia was either unaware of this rebek, or did not consider it worth mentioning, or classed it among the fiddles with fewer than 5 strings he did not think worthy of consideration. In 1310, 30 years after Jerome, Italian physician, philosopher and astrologer Pietro d’Abano also mentioned the 2 string bowed “rubeba” in his Expositio problematum Aristotelis, but he did not mention the rebec. Evidence is lacking to say with certainty which reason is most plausible to explain the 12th century mention of the rebek followed by the long silence. Its connection with the rebab, if any at all, is conjectural and lacking evidence. Left: The earliest example of a possible European rebec in the Catalan Psalter, c. 1050, often cited as such by modern writers. However, the evidence suggests this is a vielle. Right: Detail of a player in the English manuscript, BL Arundel 91 (f. 218), a Passionale (Lives of the Saints) originating in Canterbury in the first quarter of the 12th century. This also appears to be a rebec and has been cited as such but, if its 4 strings are taken literally, it has to be a vielle, and other features such a vielle, too. The earliest identification of European rebec iconography, as recognised by modern authors, is in the Catalan Psalter, c. 1050 (see images on the right), a few decades before the first appearance of the word rebek in the early 12th century. We have the 3 strings and the piriform (pear shape), so this appears at first to show that the rebec had been in existence across western Europe since the 11th century. However, the identification of the Catalan Psalter instrument as a rebec is a mistake. The piriform of the rebec looks from the top like one of the shapes of the vielle or medieval fiddle, distinguishable by the rebec having a bowl back and the vielle having a flat back, but such a visual difference is hidden in two dimensional images where only the soundboard is visible. It has therefore been easy for modern authors, seeing a 3 string piriform instrument, to call it a rebec. Corroboration from an accompanying text would settle the matter, but this is very rare in medieval iconography and, as we have seen, there is only one surviving contemporaneous mention of a rebek, which is itself problematic. It is therefore not possible on this basis to say whether the image in the Catalan Psalter is a rebec or a vielle. The same would apply to the similar instrument in BL Arundel 91 (right), except that closer examination shows it to have 4 strings. If we work on the assumption that rebecs always had 3 strings – and all the available evidence suggests this – then the BL Arundel 91 instrument is a vielle. This identification is itself based on the assumption that the depiction of 4 strings is accurate, since there are only 3 pegs. There is another visual factor which helps, and may be definitive. Barry Pearce suggests the evidence points to a visible feature to distinguish a rebec from a vielle: that only rebecs had bent-back or crescent-shape pegboxes, whereas vielles had flat peg-boxes, usually rounded, sometimes quadilateral. In his monumental survey of depictions of medieval bowed instruments in iconography, including three-dimensional cast metals, stonework, carved ivory, and wood, he found that only the rebab/rabab had a bowl back prior to 1300, therefore bowed instruments before 1300 with piriform soundboards that are not rebabs have flat backs, and are therefore not rebecs. On this basis, the instruments above in the Catalan Psalter and BL Arundel 91, dated c. 1050 and c. 1100-1125, must be flat-back vielles. However, this leaves us with the puzzle of the word rebek appearing in the early 12th century table of Arabic and Latin terms (Paris, Bibliotheque Nationale, Ms. lat. 14754). What did the word then convey? Did it mean the instrument we now associate with the word? If so, why does it not appear in surviving three-dimensional iconography, and why the long gap before its next mention? If rebek did not mean the bowl-back bowed instrument, what did it mean? When the rebec truly began is a subject of much debate, but 1400 seems a good rough guide, given the iconographical evidence. 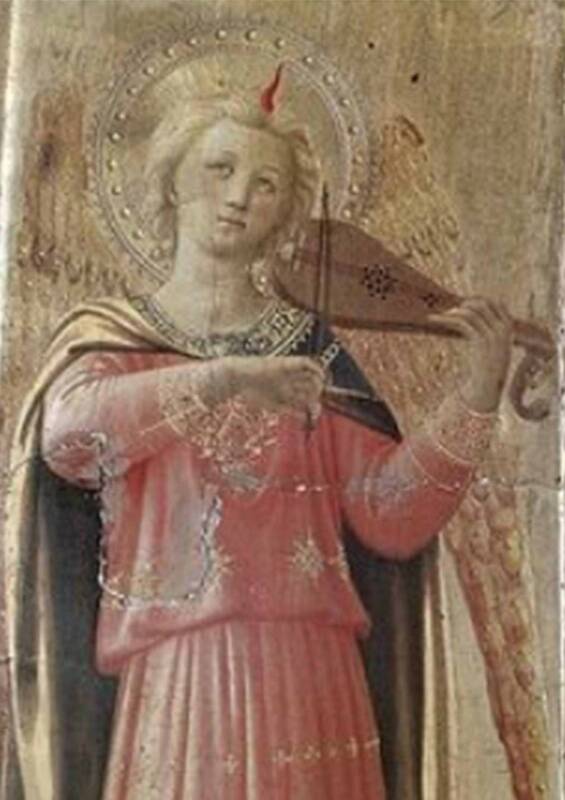 During the 15th and into the early 16th century, the rebec is regularly seen in paintings of saints, therefore associated with heaven and holiness, and sometimes coupled with the lute, which had the same associations. The rebec is like a bowed gittern: both have a bowl body carved from a single, solid piece of wood, scooped and chiselled out to produce a hollow shell, played on the chest or on the shoulder. According to German music theorist Martin Agricola, Musica instrumentalis deudsch, 1529, the rebec had 3 strings, each tuned a fifth apart. Two holy pairings of the rebec and lute. 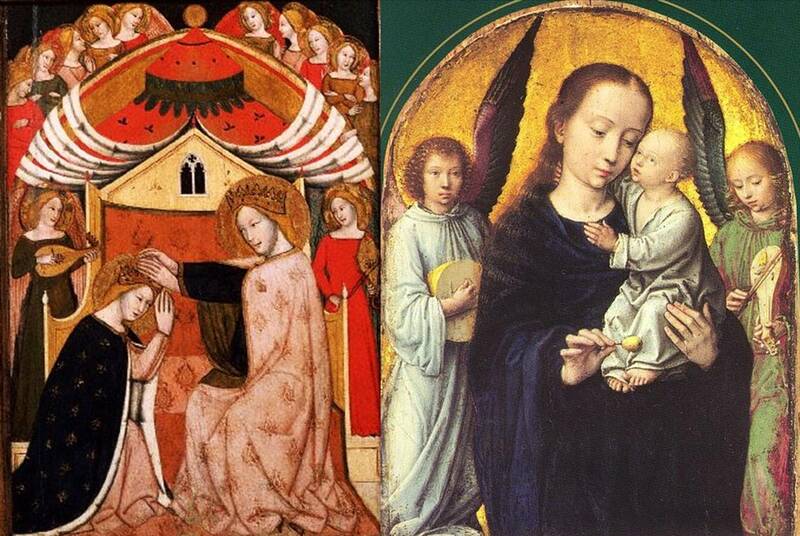 Left: Vitale da Bologna, Italy, Coronation of the Virgin, 1353. 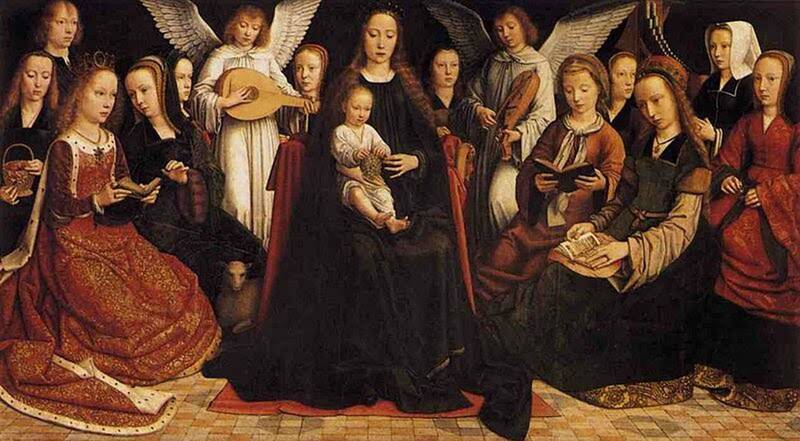 Right: Gerard David, Netherlands, Madonna with angels making music, c. 1500. Duetting lute and rebec in Gerard David’s The Virgin among angels, Netherlands, 1509. Evidence of the rebec’s royal approval is illustrated in the accounts of King Charles VIII of France, showing that he twice paid for a rebec to be played for him: the 1483 account lists a fee of 30 sol to a rebec player, and in 1490 a fee was paid to a rebec player named Raymond Monnet. However, its courtly appeal was slowly fading. Despite its association with heaven, its reedy, nasal sound came increasingly to be regarded as rural, more suitable for lower class dances. Perhaps, towards the end of the 15th century, it began to compare unfavourably with the more full-bodied tone of the new viola da braccio (also known as the lira or lyra da braccio). The decline of the rebec was slow and uneven, and it remained popular in English and French royal courts into the 16th century. No music survives specifically for the rebec. From around 1480–1500 – so by now in the renaissance – we see the rise of music written for individual instruments, most especially for the lute and, within the century, for the consort of viols (viola da gambas in different sizes and therefore pitches playing together) and the broken consort (a mixture of wind, plucked and bowed instruments playing together). With the arrival of the much fuller-sounding renaissance six or seven string viol, and with no music being written for the rebec, one might have thought it would die out completely. A tenor and alto rebec, anonymous, 16th century, Italy. But no. Though there is no surviving music for it, the rebec clearly survived through the renaissance. In his Musica instrumentalis deudsch, 1528, German music theorist Martin Agricola even stated that the rebec now had a full consort of soprano, alto, tenor and bass, as had the lute, viol, recorder and crumhorn families. In 1526, English King Henry VIII had three rebecs in his consort for state occasions. French King Louis XIII kept a personal royal rebec player, Lancelot Levasseur, from 1523-1535; and his succeeding son, King Louis XIV, had Jehan Cavalier performing the same function in 1559. An illustration marked 1590, collegium musicum or musical meeting in Lauingen, Germany (see below), shows an unusual (by English standards) mix of instruments in a broken consort, with a viola da gamba, transverse flute, lute, wooden cornett, leather cornett, harp, portable virginal and, very clearly and seemingly out of time, a slide trumpet and a rebec. 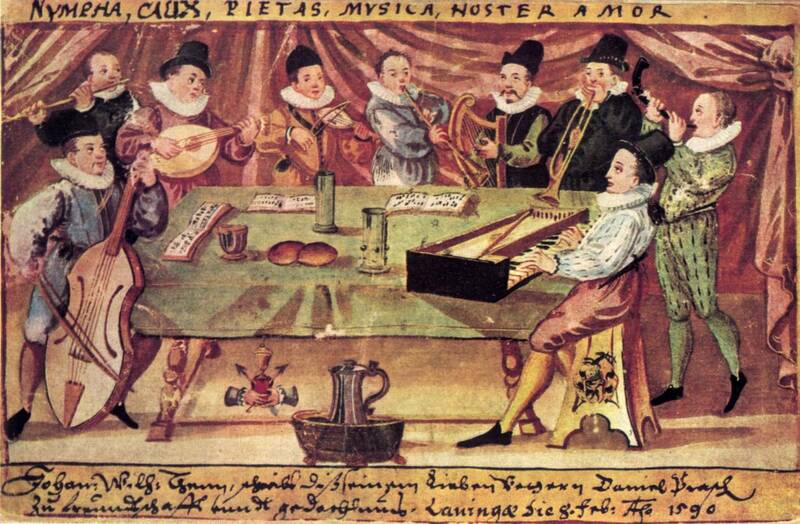 A German broken consort, the picture labelled 1590, including a rebec player fourth from the left. 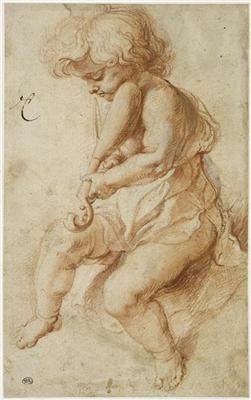 One of the later depictions of a rebec, by the Flemish artist, Pieter Paul Rubens, 1577-1640. In William Shakespeare’s Romeo and Juliet, c. 1595-96, at the forced wedding of Juliet, which appears to have turned into her funeral as she is apparently dead, Peter asks the musicians to play a piece called Heart’s ease. Shakespeare helpfully gives the musicians joke names to indicate their instruments, including one “Hugh Rebec”. Proponents of the rebec were fighting a losing battle, especially with the rise of the esteemed violin, which eventually even trumped the much-loved viol family. In 1628 the Parisian authority wanted to make class distinctions clear in who was allowed to do what and where. They passed a law forbidding the playing of high status violins in public houses, allowing only low class rebecs. Over a century later, the rebec was still being tenaciously played in France when a law was passed in Le Guignon in 1742 restricting the “amusement of the people in the streets and the public houses” to the undignified “three stringed rebec”, specifically forbidding the playing of the higher status four stringed violin. The rebec, then, has been the subject of much misidentification and confusion for modern players and scholars of early music. It hasn’t helped that some medieval writers used the catch-all term fiddle to denote any bowed instrument, but recent comparative research in iconography – both manuscripts and three dimensional carvings – has brought more clarity about the difference between the rebab or rubeba, the vielle (medieval fiddle) and the rebec, and this has resulted in a necessary questioning of previous repeated assertions, based on assumptions rather than demonstrable evidence. For modern players of early music, the story of the rebec suggests it to be appropriate for late medieval and renaissance courtly music, lowering its status to a lowly street instrument as musical tastes and fashions changed during the baroque period, before disappearing from sight during the 18th century. Unfortunately you forbid the greek “Lyra” from Bisanzio (“kamanche rumi”) about the first two pictures you show, and also the tranformation of the rebec in one type of the so called “sordino” or “pochette” (dance-teachers bowed instrument). I’m not sure what you mean by “forbid the greek “Lyra” from Bisanzio (“kamanche rumi”)”. The kemenche has a passing visual similarity to the rubeba. The Cantigas instruments are certainly rubebas, usually played da bracchio rather than da gamba, as they are in the Cantigas. The kemenche is a much later instrument. The pochette is not related organologically to the rebec (though some books say it is, without evidence). There are two Byzantine lyras found in excavations at Novgorod dated to 1190 AD, the only difference is a less evident division between the body and the neck. In general you must consider the half-moon soundholes and the leaf-shaped peg-piece: the relationship is evident. Moreover: the shape of the body is wider in lyra-type instruments than in rubebe/rebec family, even if in western areas the instrument was played “da braccio” instead in a vertical position (the same passage you see in many cases from rabab to rebec; evidently the common use of that kind of instrument in Europe recommend a standing posture: procession, dance? Who knows!). For what concerns the relationship between the rebec and one kind (not all of them) of pochette is self-evident: round rear-body (but very narrow, because the necessity of transportation in the “poche”) and three strings: what do you need more? Sorry for my wonky english. Hello, Enzo, and thank you for your reply. The Byzantine lyras from Novgorod are quite different to the Cantigas instruments: teardrop shaped, with a straight pegbox, and with a wholly wooden soundboard, as distinct from the rubeba’s long shape, obtuse-angled pegbox, and partially skin soundboard, indicated stylistically in the period by dots, as we see on the Cantigas rubeba (and other skin soundboard instruments in Cantigas iconography). I don’t think there is a self-evident relationship between rebec and pochette, also known (significantly) as the kit violin. Many pochettes had 4 strings, since they were modelled on violins, and they came in a variety of shapes, none of which replicate the rebec shape. 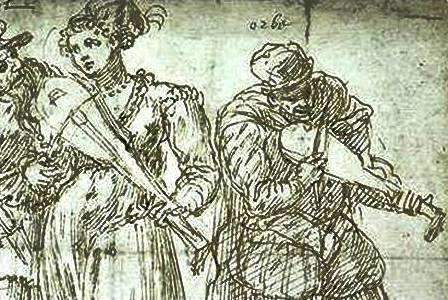 By the time of the baroque dancing masters, the rebec was a low-class instrument, so it’s very doubtful, if the kit violin were related to the rebec, that any dancing master would want to be associated with one. I wanted to trace a strict relationship between the bizantyne lyra and the so-called first examples of rebec you consider vielles, not the drop(pear)-shaped instruments in the Cantigas’ illuminations that I’ve never mentioned. In that case the derivation from the arabic rabab I think is strongly evident. The first bowed instruments we see in western art are undoubtely “rumi” lyra-like, I mean, with slightly round back obtained by carving a single piece of wood as a sound box, that is the same for rebecs. The flat bottom of late medieval “vielle” (viola, fidel) derives from a strong technological development based on the assembling of several parts glued together. On the other hand , I admit, an evolution of that kind of bowed instrument regained later the ancient name of Lyra or Lira (da braccio) because the contemporary recover of classical culture In italian Renaissance (see the Raffaello’s “Parnaso” in Vatican rooms as example) associate with a similar musical praxis (“canto alla Lira”). About the so called “kit violin” I just wanted to say that, folk or popular music apart, the only western bowed (or even stringed) instrument survived after the XVI Cent. with a carved half-round soundbox has been the type of pochette made using a rebec-inspired tecnique of making. In organology that matters. The clear distinction between the rebec and vielle visually is that the rebec has a round back whereas the vielle has a flat back, and that vielles had between 3 and 5 strings whereas rebecs always had 3 strings. There are other differences, but these are the easiest to spot. There is one more, which is decisive: the pegbox of the rebec was always sickle-shape. This is the conclusion of Barry Pearce’s Bowed Strings Iconography Project after looking at several thousands of primary source images. In particular, and this is decisive, Barry looked at three dimensional carved images of what had been taken to be rebecs when in manuscripts, due to their shape from the top resembling the rebec (though without a sickle pegbox), and in three dimensions they always have flat backs. Some instruments of this type have more than 3 strings, several have bourdons, making them decisively vielles, not rebecs. Your wording was “about the first two pictures you show” in relation to the lyra and kemenche. My assumption was that you meant the paired pictures at the top of the article, both from the Cantigas, since they are the first two pictures I show, other than a video still and the trailer for the article. I am still not now sure which pictures you were referring to. Perhaps if you give the wording underneath the picture we can be on the same page. For the rebec to be derived from the “Arabic rabab” to be “strongly evident” requires two conditions. Firstly, that the “Arabic rabab” (whatever that may mean, as the word is not very specific and has been applied to several very different instruments) was indeed an instrument that was played in the west. On this I will reserve comment, as I know it is the subject of research soon to be presented by Barry Pearce and I have no wish to jump the gun, but let me just say it is not as we have repeatedly been told: the repeated story lacks evidence. The second condition is definite evidence of a transition or conversion of the rebab to the rebec, in other words that there was an evolution of one to the other, before which the rebec did not exist. For this I know of no evidence and, again, Barry’s work poses questions about the repeated story of the supposed but not evidenced relationship between the two. That both lyra (again, a very unspecific word relating to several instruments) and rebec were carved from solid wood signifies no relationship in itself: this was also true of vielles, gitterns, citoles, kobzas, etc. This also relates to your statement about the pochette. It is a question of evidence. To state that the pochette was “rebec-inspired” requires evidence. I know of none and, indeed, as I stated in my last reply, the circumstantial evidence (since there is no direct evidence) is against the relationship on the basis of social status. a dolphin or a rebec, a fish or a pochette? We poor mortals can’t never grab the truth. Enzo, since you have not engaged in the substance of my points, cannot provide the evidence that is needed to substantiate statements of fact, and instead engage in sarcasm, then I can only conclude that you would like me to agree with you without providing any substance, but only ‘this is obviously so’. In an adult discussion, points of fact require rigorous substantiating evidence. The pochette you link to has no material bearing on the debate we have been engaged with: whether a pochette is a pochette has never been in question. There are plenty of writers of books and websites who make unsubtantiated claims: that the guitar is descended from the lute; that Henry VIII wrote Greensleeves; that troubadours played hurdy gurdies. I’ve seen these claims repeated again and again, but they are demonstrably untrue. As for the debate above which you initiated, other readers will make up their own mind about where the evidence lies, where there is any evidence at all, and the conclusion they draw from your disengagement and sarcasm. Any further comments you post on this page which engage meaningfully with the evidence will appear and will be replied to. Any further bad temper will simply be deleted before it appears on the page. This is a website for information and civil debate. You are free to disagree with anything, but I will always engage and ask for evidence, upon which everything depends. Others, by this means, have provided me with information and insights I did not previously have, and by which I have revised articles. For this I am grateful. If you could do the same, I would be grateful to you. But bad manners and sarcasm will not be tolerated on my website. Im Barry Pearce – im a researcher of bowed stringed instrument history. I just thought I would add a few things here. Enzo, When you say Sordino, do you mean the instrument as depicted in 1723 by Arnoldo van Westerhout? Which although piriform is clearly not round backed. Can you supply any images to describe what you mean – I ask this because as you will see me discuss shortly names of bowed strings are almost next to useless when designating a specific instrument type. Do you have references you can provide – in particular with the “transformation”. Many claims are made about the evolution of instruments in darwinian sense – mostly based on visual similarlity without any evidence to support the claim. The Pochette is more interesting- it is not, despite many many claims, related to the rebec. The problem here is one must not use language to define instruments the word pochette applies to many instruments – as does the word “fiddle”. The pochette is a 4 string instrument made with violin bridge, fittings, fingerboard, scroll, pegs etc etc. There again the pochette also does refer to a “kit” which is not a pochette instrument of narrow body in segment shape, but is miniaturised violin body whilst keeping the neck and fingerboard and scale length the same. Also the idea of the dancing masters fiddle is a curious definition for the pochette. There is far more evidence of it being in the hands of commoners than dancing masters. It may have been used by a dancing master. As yet I have to trace where this term originates. The sheer volume of modern references to dancing masters fiddle suggest there has been a skewing of history. It would be interesting to know how many dancing masters actually operated during the period in which the pochette is actually seen. At this point its advisable to consider two important items. In using names to analyse historical bowed stringed instruments were are slaves to the nature of language, and its all its issues. The use of language and meaning over time changes, and changes from geographical location. Consider this. If I have a violin, I take it to italy – the same instrument mind – they call it violino, all seems similar but we are already into the hands of etymology to make sure that the names are similar for the right resons, I dont think in this case any will complain. Then I take the same instrument to Germany. It is now called a Geigen. The instrument has not changed. Not one iota of difference. This is why language is an issue. More confused when you realise Geigen just means fiddle and is applied to more instruments than just the violin. In essence language is not a suitable mechanism for analsying anything. One must be careful in talking relationships, there are only so many ways to create a bowed stringed instrument, just because something is similar to something else does not necessarily mean there is any association. This is discounts the possibility of similar designs occuring simultaneously in different places – which means that one must subscribe to a “family tree” idea – all instruments are related to a common ancestor. This rather out-dated theory from the late 19th century and early twentieth centuries and has affected much thinking of the 20th century. Organological, and morphological similarities do not necessarily mean there is a relationship. Ian, I wouldn’t say the rubeba is most commonly played da braccio – it is very much split accoding to time and place. I call it a rubeba because who knows what else to call it….names (once again) are a major stumbling block. Moving onto Novgorod, and the so-called rebecs and fiddles. What is curious here is that they have been designated such, none of the instruments were found with bows. It is complete conjecture to such how they were played. However, I also have iconography which would support them as plucked instruments. It seems equally as valid as their claims – moreso because I do not have to make the facts fit – there is an interesting report on JSTOR which provides details. Here you can view the actual evidence they use to justify the claim, and its problematic at best. BTW the so-called rebec from Kiev they refer to uses a manipulated drawing from Werner Bachmann – drawings which have been manipulated are not evidence. I have copies for photos of the actual fresco and one can see that the lines drawn by Bachmann have been altered to match his point of view, rather than reflect what is actually present. This is why primary sources are so important. Popławska, Dorota, and Dorota Popłavska. “String Instruments in Medieval Russia.” RIdIM/RCMI Newsletter 21, no. 2 (1996): 63–70. When you say in many cases – What cases are these precisely? I asked because I have no evidence for a rebec every being played da gamba. Equally the evidence I have regarding the skin bellied – rubeba does not match the idea of transition. And to be honest given this was subject of a presentation of mine last year I know we are dealing with a very limited number of data points here – just 67 sources covering 250 years from the whole of europe. I believe this should be almost 100 sources though as I know there are more sources in spain I have not had access to yet. ?? If you have this evidence it would be of great interest. I have been searching for 5 years for this evidence so far. As for vielles not rebecs – how do you define a rebec from a morphological perspective – and can you show that the instruments you think are rebecs actually conform to that definition? Equally can you provide any evidence of 3D artworks which support the concept of round-backed instruments? Have you also considered that the width of many of these piriform instruments means that even a 10cm deep bowed back cannot would be problematic? As width increases the curve of the back must descrease else the depth must increase – there is a limit to how much can be done before one can no longer play these instruments up high. I have to ask for specific references here. There is one byzantine lyra the dating is VERY WIDE. c.950-1049. Additionally how do you know they are single piece wood and how do you know that they are even round backed? What is the primary evidence you are refering to? When you say “late medieval vielle” do you mean the period 1250-1500? When you say “derives from a strong technological development ” Are you suggesting that the ribs are separate? Moreso are you suggesting flat backed instruments did not exist in the 10th & 11th centuries? That they developed in the 13th onwards? The use of word Lyra or Lira being reintroduced seems to be an unrelated shift. The words lyra and lira do not refer exclusively to bowed strings – see my comments above regarding language. How have you determined it is “rebec-inspired”? There are only something like 6 ways of making a soundbox and that covers all bowed instruments in the world over a 1200 year period. You seem to be equating the round back with a single form of construction- that of hollowing out. Yet we know that instruments from 1545 were based on this construction technique. One should not confuse the means to construct a soundbox with an external shape. Have you considered that it is not so much rebec inspired bit a question of forces and engineering – with the need to place enough rigidity in the instrument to cope with 25-30KG of tension (I know this should be in Newtons but thats bowed strings for you!). Thank you, Barry. Your encyclopedic knowledge, based on original primary research, is much appreciated by me, and I know by others. I do hope Enzo will return to the discussion. I’d be very pleased if there are there are things he can learn from your rigorous approach. I certainly have.